Now this sounds like fun. BRITAIN is braced for the biggest invasion of warriors since the 11th century. More than 3000 fighters, a threefold increase on the previous Mega Battle of 2000, are massing in full war dress this week to play out a specially extended script, to commemorate the best-known date in British history. But in a revisionist twist, the ranks of the Norman, Breton, Flemish and Saxon armies are also swelled this year by an army of multicultural mercenaries - including Australian Steven Lowe who plays English King Harold's brother Leofwine Godwinson - who could well give King Harold the upper hand. "It has gone completely crazy for some reason. We have got 18 countries worldwide taking part," said Alysha Sykes, who is organising the 940th anniversary event. Among the re-enactors flying in are Poles, Russians, Czechs, Americans and Canadians. Two Frenchman have broken ranks for the first time to fight for the Saxons, the Germans are sending more than 100 for Harold, and the Finns have mustered 16. Admittedly, Iceland's 22 men are fighting for William the Conqueror, alongside the Irish. 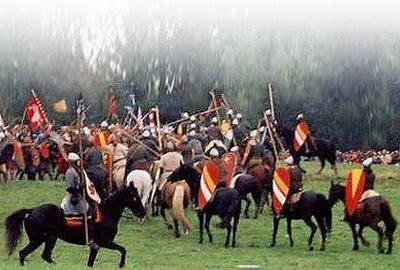 But despite such minor historical inaccuracies, the nine Saxons walking all the way from Stamford Bridge, Yorkshire, to Hastings, in full gear, believe this year will be the closest to the original. "This year is the real Mega Battle, it is going to be much more lifelike," said Peter Campbell, a 54-year-old archives clerk from Rochdale who is making the trip to prove that the soldiers who were unhorsed at the Battle of Stamford Bridge, on September 25, 1066, could have marched to Hastings in time to fight again for King Harold. The Battle of Hastings re-enactment is held every year at Battle Abbey in Battle, East Sussex, and typically attracts up to 7000 spectators. This year, with the event falling on the actual anniversary, October 14, organisers expect 20,000. The battle-script has been extended to accommodate the extra bodies and more accurately reflect the original. Frania Juchnowicz, the battle captain of the Vikings re-enactment society, who is arriving from Leeds to choreograph the soldiers, said: "Although the battle is going to be shorter than the original we are trying to keep in some elements of all of it. "For example, we think William lost three horses early on, but we can't do that because of safety and space issues, but we are going to show him going down off a horse, to represent that," he said. A historian, Dan Snow, has been called in to commentate on the battle, but the organisers are relying on the warriors' "acting skills and presence" to tell the watching public who they are. Roger Barry, a 49-year-old sergeant in the Military Provost Guard Service, playing Harold, is fairly confident that the on-lookers will know who he is. "When the archers raise their bows, I will produce a dummy arrow which I will place to my eye and collapse heroically. Then I will retire to the beer tent."